These are high quality urethane domed decals replace the current BRP logos with the Lamonster logo created for Lamonster. Made to automotive grade specs these decals should have a lifespan of 6 to 20 years. 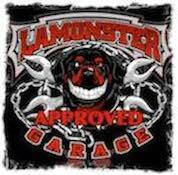 After the stock decal is removed simply clean any residue from old decal area and apply your new Lamonster logo decal. Decals come in three sizes to replace all current stock decals. Now includes the 3/4" decal to replace the BRP logo on the center cluster. Replacement for Spyder GS/RS/ST/F3/F3-S/F3-LTD (with top case) front trunk and rear cowl and rear fender on the F3 “one large one med. " 2017 F3 Limited. Large for the front, medium for the trunk and small on the dash. Followed the video instructions and the old emblems were removed an replaced in just a few minutes. Love these cool replacements for the ugly BRP logos. High quality. Another great product from Lamont! A quality direct replacement for the ugly BRP emblems!